If you're looking to use coupons realistically in order to stretch your grocery dollars, you've come to the right blog! As you can see, there haven't been any new posts from me in a very long time. Earlier this year, our family decided to take a huge leap of faith. After much thought, my husband and I decided to pack up the family and move to Cheyenne, Wyoming. Between job searches, road trips to scout the area, getting our local home ready to sell, buying a new home, packing up, and moving cross-country, my time was at a premium and something had to give. So, this blog was put on hold. Today I started a new blog featuring mostly Wyoming deals, Thrifty Wyoming Mom. At this point, I'm planning on leaving Reality Couponing in Rochester up, since there are still some helpful links available to any readers who stumble upon it. I hope you have found this blog useful and wish you many happy (and inexpensive) shopping trips in the future! It's Mega Swag Bucks Day -- Have you done your search yet? I've done one search already on Swagbucks today. Have you? Every Friday is Mega Swag Bucks Day, where the chances of being rewarded large denominations of Swag Bucks is increased. What are you waiting for? Go do your searches now! Swagbucks is a search engine (like Google or Yahoo). You are awarded points randomly (called Swag Bucks) when you search the Internet, answer surveys, watch videos, play games, etc. Once you sign up (it's free! ), you can also refer friends and family and earn points from their referrals. I normally earn my points through doing the web searches only (and really, who doesn't already do that? Why not get rewarded for what you're already doing?). I seem to get points after my third or fourth search and I try to do it once in the morning and again in the evening. When I earn points for a search, they are generally in the 7 - 10 point range. I've also done some surveys and earned a bunch of points very quickly. And every Friday is Mega Swag Bucks Day, where the odds of winning high-value Swag Bucks are increased. Swag Bucks are redeemed in the Swagstore. While there are a lot of things to choose from, my favorite item hands down is the $5 Amazon gift card for 450 points. I know, that sounds like a lot of points, right? Trust me, if you commit to doing 2 searches per day, the points can add up quickly. I started using Swagbucks in June 2011 and and have happily cashed in for Amazon gift cards which really help with my Christmas shopping. Who doesn't like saving money on gifts?! Interested? Sign up at Swagbucks (remember, it's free) and start earning free stuff! Care.com - Find A Babysitter - Join Free! Search thousands of local babysitters' profiles for Free! It's that time of year again -- tax time! Have you started your taxes yet? 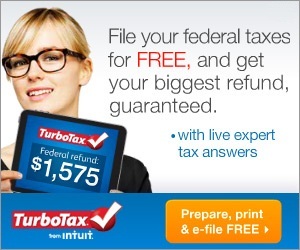 Click here or on the banner to start your taxes with TurboTax. Notes: These are part of a current gas promo, where you earn 200 bonus gas points for every 4 select boxes you buy (that's $0.20 off per gallon!). Also, activate the $0.50 eCoupon at SavingStar before shopping so you can get some money back. Notes: These are part of the above gas promo. Alternatively, the above $0.50 eCoupon at SavingStar can be used on these instead. Notes: These are part of the above gas promo. Activate the $0.50 eCoupon at SavingStar before shopping so you can get some money back. Notes: These are part of the above gas promo. Also, check the backs of any boxes you buy. The ones I purchased today had $0.50 coupons on the back (exp. 11/30/13) just like the ones I bought a few weeks ago. Today's shopping trip had a retail cost of $40.68 and I paid $14.80 after coupons and discounts, for a savings of about 64%. My gas discount is now $4.10 per gallon -- which means FREE gas for me. I love free gas!!! I'll be stopping in for probably one more round of cereal (if the kind I want is in stock), more tuna, and a few other items. Until tomorrow, happy shopping! 2/3 - 2/9 Tops shopping: cereal stock-up galore & more! Note: These are part of a gas promo -- earn 200 extra gas points for every 4 select boxes of cereal you buy. Note: These are part of the above gas promo. The retail cost the this transaction was $44.10 and I paid $14.00 after discounts and coupons, for a savings of 68%. Note: These are part of the above gas promo. Activate the $0.50 eCoupon at SavingStar before shopping so you can get some money back. The retail cost of this transaction was $39.10 and I paid $10.67 after coupons and discounts, for a savings of about 73%. The retail cost of the third transaction was $44.59 and I paid $10.00 after discounts and coupons, for a savings of over 77%. Overall, today I spent $34.67 on $127.79 worth of groceries. That's a savings of approximately 73%, plus I'm at a gas discount of $3.60 per gallon (that's almost free gas and this is only the start of the 2nd week of the current earning period!). Believe it or not, I'm planning on buying some more boxes of cereal and a few other deals throughout the week. Stay tuned for more Tops deals. Until then, happy shopping! In this economy, we all are looking to stretch our dollars. I created this blog to keep a record of my couponing successes and hope to help others save some money along the way, too! Posts may contain affiliate links, which do not influence or change my opinions. Watermark theme. Powered by Blogger.